Is it not fine to see the development of oneself? The finding of one's own tastes. The final selection of a most favorite theme; the concentration of all one's forces on that theme; its development; the constant effort to find its clearest expression in the chosen medium; an effort of expression which commenced with the beginning of the idea, and follows its progress step by step, becoming a technique born of the theme itself and special to it. The continuation through years, new elements entering as life goes on, each step differing, yet all the same. A simple theme on which a life is strung. ...but someone here does thank goodness...and yesterday this picture was posted of Orlando Bloom wearing our 18k Emmie. Normally I don't kiss and tell but since Perez already posted this picture I thought I might share it, too. 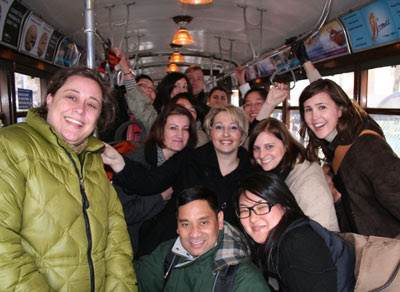 Yesterday's JP holiday field trip proved to be one of our most fun events so far--I think we may have gained a customer or two on the trolly based on our charismatic and ephervescent personalities. A little time was carved out in the middle of our busiest season, and just the idea of travelling away together to someplace otherworldly---a behind the scenes tour of the aquarium---was a psychic vacation. I love my team, they are gifted, extroardinarily lovely people. Hats off to the kids! and especially to Megan, the organizer for making our fun field trip happen so seemlessly. through the wildest storm of all. ...makes me feel like Miss Havisham. It is a bit nutty in my dining room/playroom/workroom but it works. I am always taken aback by the creativity of Federico De Vera, especially at the holidays. This years 'card' came in an unassuming manila envelope. 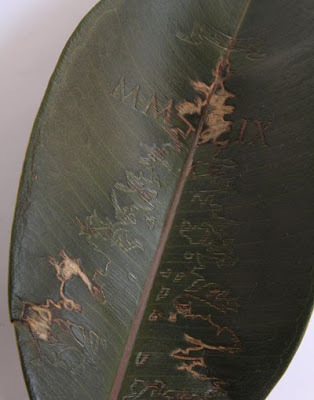 It is a rubber tree leaf with an image pressed into it of a Christmas tree, roman numerals and a tiny 'De Vera'---an example of Federico's unique ability to give us a surprising lens to view his idea of beauty. The landmark Phelan Building was built before the 1906 earthquake and then rebuilt twice its original size after burning to the ground. Each suite has gas and water and lends itself to the business of making jewelry, dentistry, hair salons, etc. It was the jewelry hub in its day. 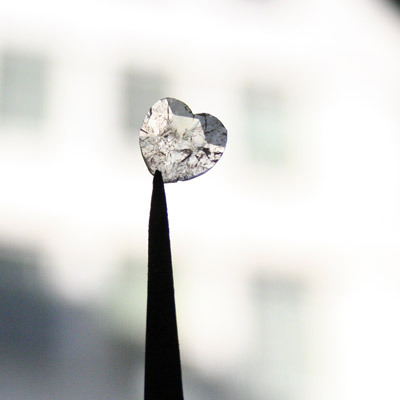 Although Union Square is an unlikely place to be manufacturing jewelry, we have been doing exactly that for 17 years. It can be challenging at times, the studios are connected like a rabbit warren and we have them scattered over the 5th floor, but it works somehow and I kind of love it. Being here we are connected to a long history. Many stone cutters, setters, and all sorts of jewelry craftspeople are our neighbors-- something we almost take for granted. I go next door to Hong, the gemcutter. He has been in the building for 27 years. 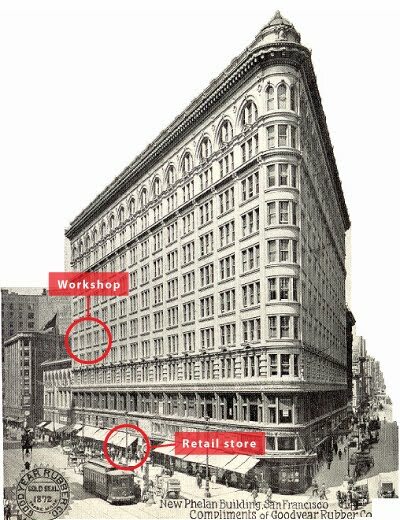 Having our store within the same building also creates a synergy between studio and customer. It may sound corny but I always loved how Hermes has workshops above their store in Paris. A romanitic idea, but also good business to keep everything close where quality is assured and communication flows easily. For us, making small, intimate pieces that say so much in such a tiny scale, it all makes perfect sense. The small black and white book in front is from one of my favorite stores on earth, 10 Corso Como, in Milan. I never feel alone or without inspiration close at hand with books around. Books are one of the expenses I don't feel guilty about. They are as important as hammers or torches in my world. Congratulations to Eva Archer Smith, the lucky winner of our Avalon necklace giveaway. When notified, she gasped, "I'm at the airport or I'd be screaming!" A Houston resident and a long time collector of Jeanine Payer (her first pieces were a pinky ring and earrings purchased nearly 20 years ago), Eva entered the giveaway by purchasing the Giovanni ring to replace her wedding ring. I always love how Kazu wears her 18k and silver Wyatt with her chunky watch--and somehow it never seems to get scratched even though I think she wears the combo every day. 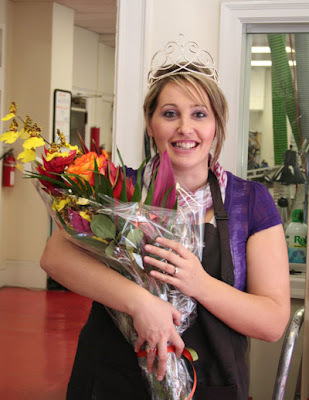 Elvedina, thank you for ten years of hard work, love, sweat and tears. 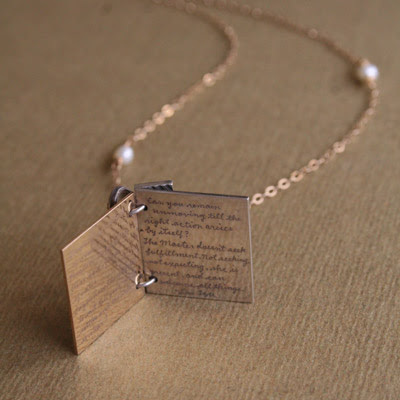 I made an interpretation of a book necklace with the writing on the edges of the page back in 1995. It ended up looking like a rolodex. It was not a 'commercial success' but I really liked it. One day while playing around I tried the idea in a ring. It was bold--it reminded me of a movable Stonehenge! The Wolfgang has been one of our most popular designs ever since (Ellen DeGeneres even has hers in 18k.) I have made a lot of mistakes and unpopular pieces in order to find the one with the perfect pitch. In 1989 I had just discovered the work of French artist Christian Boltanski and his use of faces, mainly children in reverential and church-like settings. Though his work has a darkness, this ouvre inspired me to want to use photographs in my work. 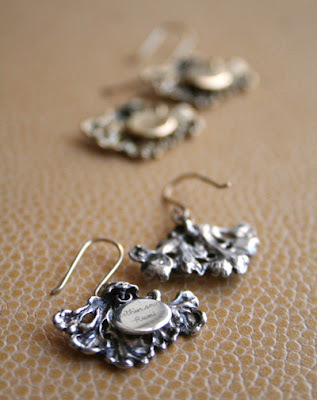 Jewelry became a new extension of my creative expression. I incorporated miniature nails (from the train store), tiny grey feathers, insect wings and locks of my own hair. 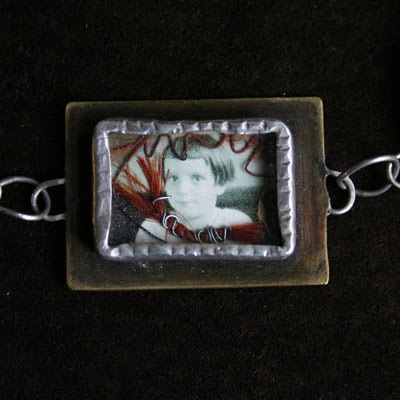 Looking back I think I was rebelling against the upbeat, cheerful art jewelry I was seeing in museum stores and boutiques. These pieces were highly personal. 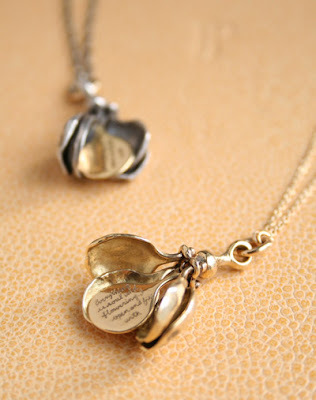 The Wink necklace has been in our collection for nearly 14 years. Over time the centerpiece became a singular tiny child's image from the turn of the century. 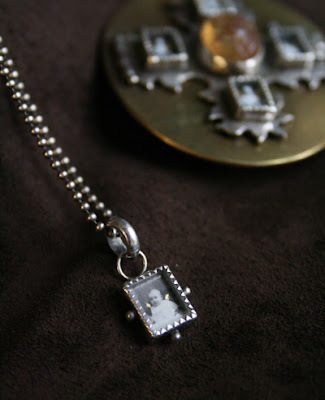 I would say it represented potential and hopefulness, a good luck charm similar to a medal with a saint's image. 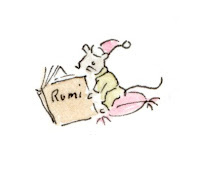 The addition of Rilke poetry added a depth combined with the mysterious, sweet image. Gold leaf gave the photos an almost religious aura. 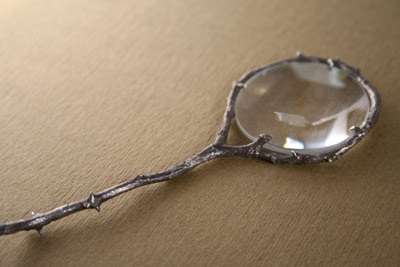 A cast branch from a miniature rose bush became a looking glass about 15 years ago. One has to be very careful when picking it up to avoid the sharp thorns and I have noticed that this creates a tension when using it to read. I have always thought that reading the poems from our pieces cause a slowing down necessary to really hear the words. The Ildiko necklace from the 20th Anniversary Collection was inspired by this piece after one of our dear customers, Mona Helen, asked me to make a magnifying glass she could wear. Just now while listening to the Vertigo soundtrack I managed to knock over a few bins from my shelf. 4 leather bracelets tumbled out and landed in front of me right at the music's crescendo. I was giddy, you see, because I do not really remember making them. It was way back when we were first playing around with leather...and these are so now and wow. The Gods of Bijoux are telling me I must bring back the large leather bangle with a Wienar Werkstatte twist and I should listen. 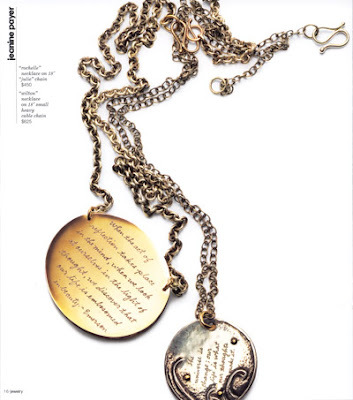 The new jewelry book just arrived in the studio. Who's brilliant idea was it to use metal filings as the background? And the pieces of mine that Judy Collinson, Barneys GMM, hand picked are complete opposites. I would never have put them next to each other...and would never have mussed up the chains like that either--very fresh. 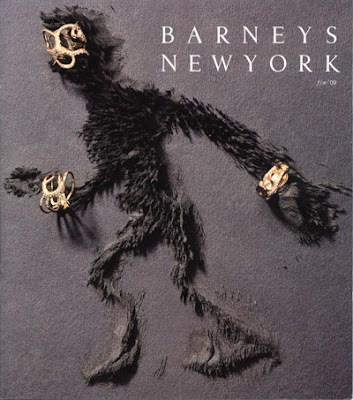 This book was designed in 1996 after having made several very detailed and whimsical book necklaces and the words inspired the design completely. I engraved so many of these over the years. It talks about a warrior passing through adversity and I appreciate that the warrior is referred to as 'she'. They were careful as someone crossing an iced-over stream. Alert as a warrior in enemy territory. Courteous as a guest. Fluid as melting ice. Shapable as a block of wood. Receptive as a valley. Clear as a glass of water. Do you have the patience to wait till your mud settles and the water is clear? Can you remain unmoving till the right action arises by itself? The Master doesn’t seek fulfillment. Not seeking, not expecting, she is present, and can welcome all things. My BFF Michael presented me with a very special Oscar De La Renta work apron today--no telling where he got it. It is the same print that Anna Wintour is wearing in the new documentary The September Issue. Michael said I am a Dries-Oscar-Lanvin sandwich...it rarely happens that I am in Full Glitz in the studio. 3000 B.C. 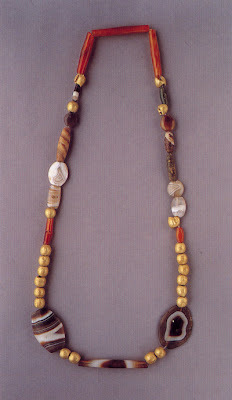 gold, agate, carnelian, jasper and marble. From the book Treasures from the Royal Tombs of Ur. In '98 I went to this show in NY at the Morgan Library and now I am giong back and really looking at the pieces with fresh eyes. This piece in particular is so modern feeling that it is stiking. They used a great deal of lapis with gold and carnelian which I have never been a huge fan of until now. This morning Darby came to my design studio and held out her hand with a surprise inside. "I don't know what this is but I thought you would like it!" 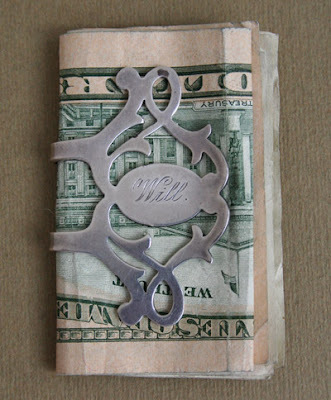 Right away I knew it was an antique money clip with my son's name so beautifully engraved on the front. I just love it. 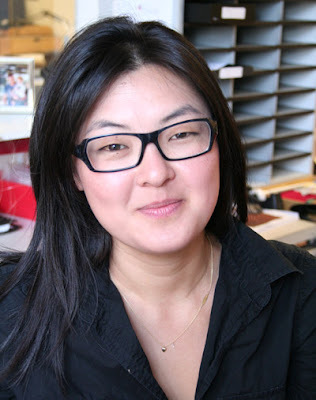 Janet K. on Bahktli, aka "Bella"
After being away for two years to take care of her two young girls, Bella and her upbeat attitude, are back at Jeanine Payer. Her favorite piece is the Edmond. 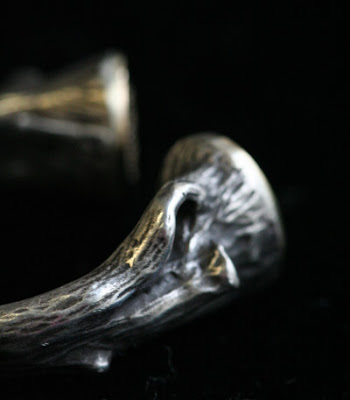 She enjoys the process the most, beginning with the cleaning of the casting, ending with soldering the jumprings and antiquing them. She brings the piece to its final stage for the engravers. 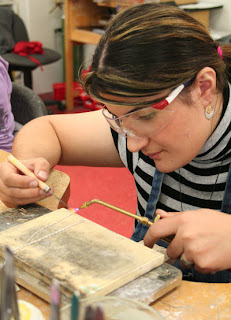 Today she is working on the Billie necklace and I caught her soldering one of the jumprings to the chain. She is currently eyeing the Fabienne two-tone earrings which she plans to get for herself as her next piece. Bella is famous around here for her keen eye for both antiquing the poetry and hand-polishing. Little Man came to visit before we went to Yerba Buena Gardens and Zeum. We enjoy a labyrinth made of hedges, a carousel from 1906 and a 25 foot slide. The park is a stone's throw away from the studio right in the middle of downtown. The perfect way to decompress after a looong day in my studio working on Valentines Day. 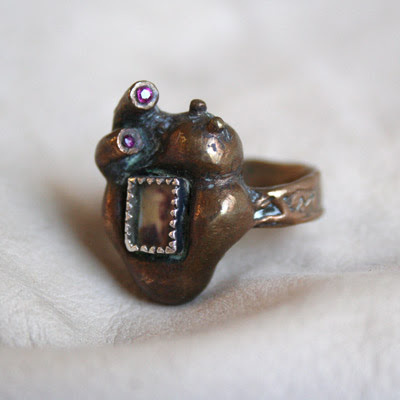 Here is one of my first cast pieces from the early 90's and it is made of bronze, silver with two small rubies. I was very into Frida Kahlo, Mexican Milagros and folk art at the time and this imagery inspired my anatomical heart ring. Today our new engraver, Ben Coulter, started working on actual production pieces after an extensive practice period. He said he just 'got it'--it is a muscle memory thing. One has to have a high level of concentration and you also have to train your body to be relaxed while doing it--you are worried you might leave out a word! 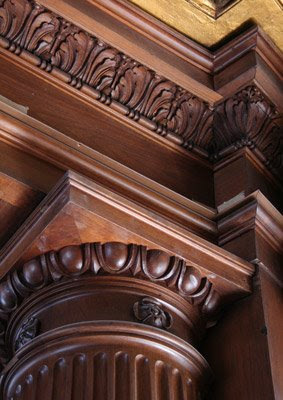 Engraving is something that can only be done in short spurts. It can be fun but you can't do it all day. So when Ben is not engraving he is helping out in other areas in the studio. 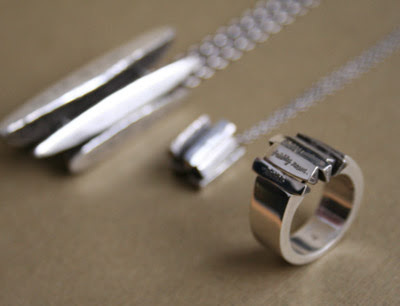 Congrats to our Ben as he sets out on engraving his first real pieces!! 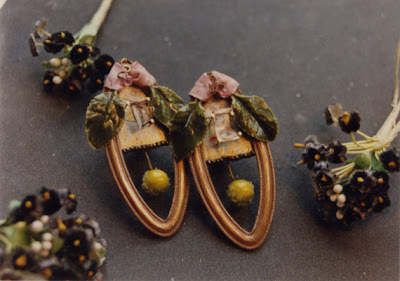 These were some of the very first pieces I made in the late 80's. I found a secret bead store in North Beach called Yone . The owner was an eccentric and artistic soul who had wonderful objet d'art in his window along with a Ruth Asawa sculpture. I was wearing a pair of these earrings when I went into the very first store I ever sold to, Teliao, on Brady Street. It was next to Bell'ochio where I bought hand dyed ribbons and vintage millinery supplies. The materials inspired me to make these miniature assemblages...not sure what to call them...but the are HUGE. They sold for $80 a pair at retail and each one took a zillion hours to make. 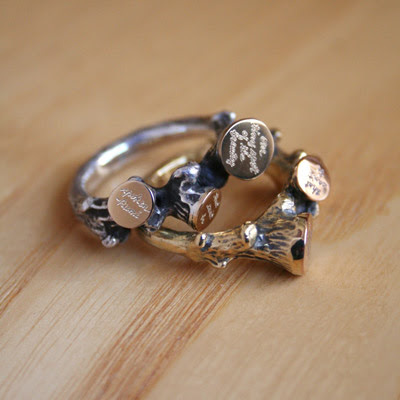 this is a ring from the new collection. While drawing this collection, I surrounded myself every morning with flowering dogwood and cherry blossoms and was deeply inspired by the turn of the century works of Faberge and Lalique so full of poetry and astonishing detail. 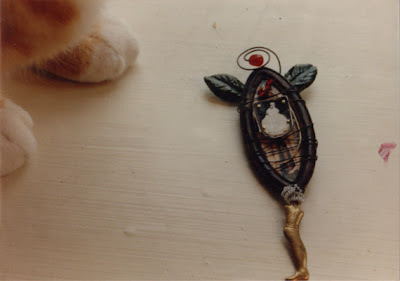 I realized that movement was inherent to the butterfly and that the pieces, like a lot of Faberge's work, had to have a magical secret to them-- in my own early pieces I made pieces with mystery such as an anatomical heart ring with a hidden door, a 'Travel Book' that opened to expose a tiny keyhole with a picture inside. This new collection goes back stylistically to my earliest creations in that they are all about the power of the secret. 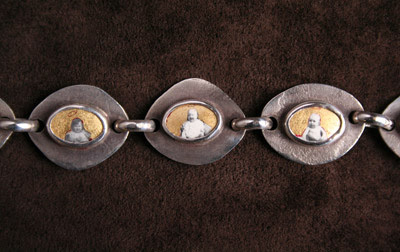 I think of these pieces as small meditations to be worn together or next to each other. 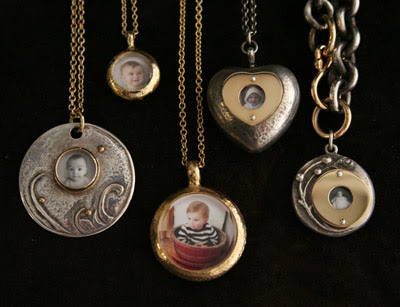 Making the Wedding Dress and Flower Girl necklaces, I thought of the dense silver and gold charm bracelets worn by my mother and grandmother that I played with as a child. 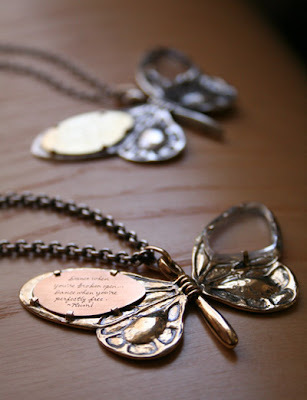 Each pendant contains a private meaning, a poem that carries a potency that helps tell the unique narrative of the person who wears it.…. I am so proud of every single piece—they are magic--- and am so happy to present them at this milestone in my life as a designer. While working on this collection I did many drawings of flowering quince, cherry and dogwood that I had all around in my studio. Quince was the perfect flower in which to hide a poem. I had thought a lot about how Faberge hid poetic secrets inside his eggs and I felt challenged to make something in this spirit. Each of the 4 outside petals I carved individually from wax . On the sterling version the inside petal is gold and contains the verse from Rumi translated by Coleman Barks. I carved this small piece of moss from a piece of wax and it is articulated on the back as well as the front. It took days and a lot of concentration and many drawing studies. 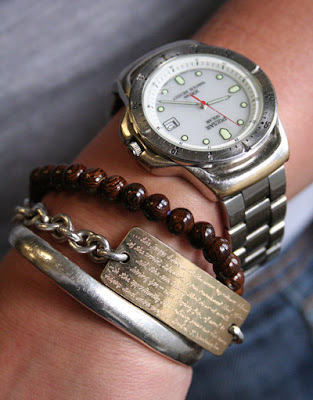 Juxtaposed against the detail, it has a small clean oval where the engraving sits that quiver when worn. These are my favorite earrings to date. 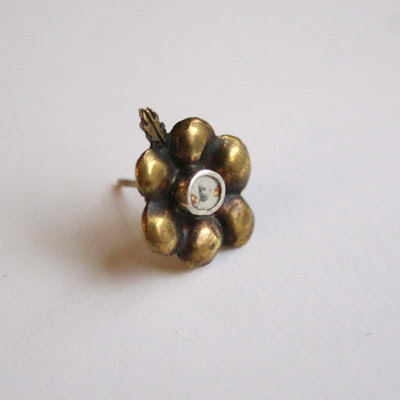 I think of this ring as a small sculpture. It was a free form experiment and it looked very funky in the wax. 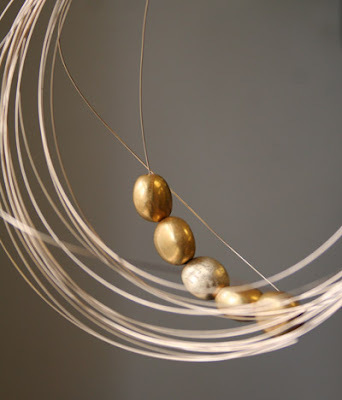 We cast it as an afterthought just to see how it would turn out and it became an instant favorite in the studio immediately inspiring the larger Kothari ring and the babies, Katja and Teja. 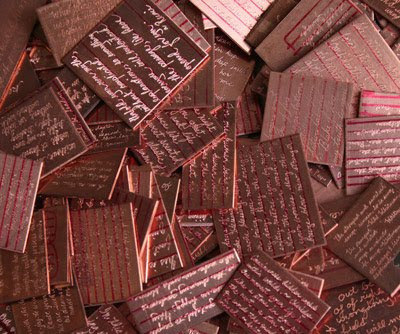 Gold plates are laminated to the ends where the poetry sits and I used rose gold on the 18k version. I think it would make an unusual and distinctive choice for a his and hers set paired with the Kothari. 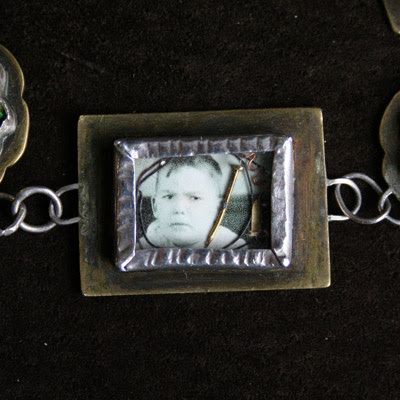 many of the charms on my mother's bracelet move, like this circus monkey. When I was little I played with my mom's charm bracelet all the time. It was in the scale I loved! The fact that the charms moved, opened and jingle-jangled when worn just made it as fascinating as the story it was telling charm by charm. It was as large as my head, or at least it seemed. Mom just let me play with it agian for this photo...and I have secretely been wearing it a bit...I am having a big love affair with charms right now as a result. This was my grandmother's gold charm bracelet from the 60's. Each on has a date on the back. 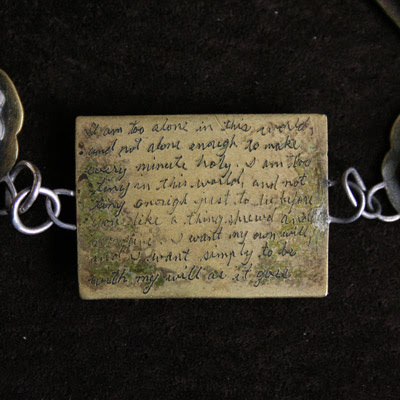 When I first started making jewelry I discovered early on that I could engrave very minute words into metal and that a poem worn against the skin was very intimate. 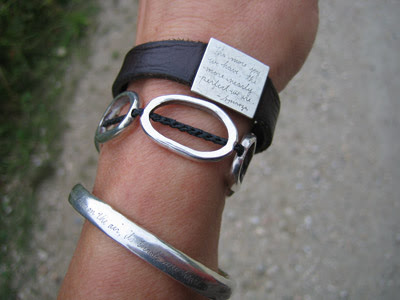 It was a cool secret that I had an entire Rilke poem hiding against my wrist. Quirky and idiosyncratic it was like nothing I had ever seen before. I started making one of a kind book pendants that had details, like keyholes with photographs smaller than a grain of rice, and sometimes the odd tiny sea horse under glass. For this 'book' necklace I hammered the wings out of metal and that is what gives it an Art Nouveau feeling as I used an old world technique. 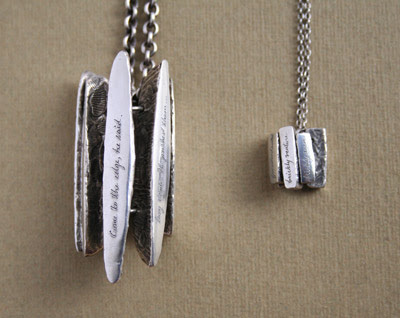 You can see one of the two Rumi poems through the crystal set on the wing. The other wing has a plate of gold that carries two different Rumi poems. I love this piece most of all because it takes me back to the idea of the book --only this book can fly. 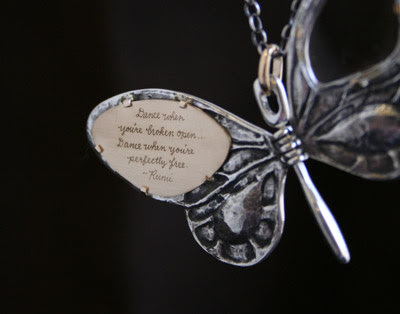 It hangs open, closes or inside out for a more abstract textural look to the wings. Vineet is our computer wizard in India and this is his adorable son. 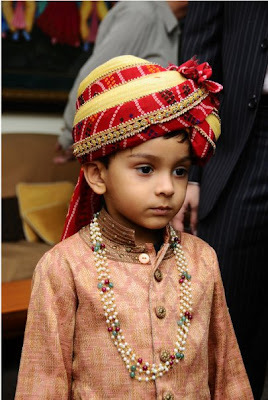 He is at a wedding in this picture. I want his entire outfit. ...and found a treasure upstairs from our studios. 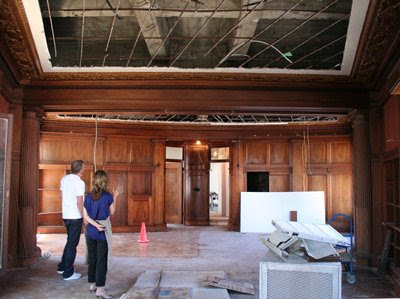 They are renovating the late Mayor Phelan's offices circa 1907. I found out that when Macy's occupied this floor they covered up the windows, walls and floors to protect it. 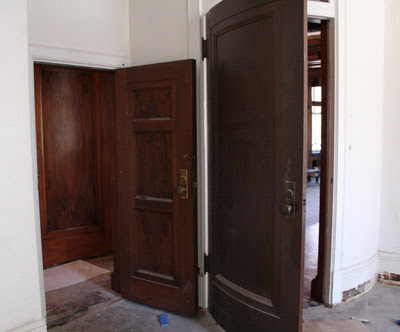 The entry doors are curved with glass transoms and the original windows are actually in front of the modern windows that were added later. There is even a full shower off the main room! James Phelan was the mayor of San Francisco just before the 06 earthquake and later a Senator. There is a secret mini penthouse on the roof that was built for his mistress and I snuck up there as well years ago. It feels like a grand little dollhouse with small columns, a fresco on the domed parlor ceiling that is peeling and there are french doors out to the deck. They rented it out to a photographer and his wife back in the 60's but it has been vacant ever since. It is my fantasy to have them rent it to me for my studio someday.